A5 in size (147*207mm), Padded at the top, 100 pages per pad, hard backing - or made to your specification. Any detail you require. Printed on A4 or A5 160gsm card. Printed on 80gsm sheets or padded or on 160gsm white. Normally A4. To differentiate here we term business cards printed on one side and appointment cards on both sides. Black or colour print - printed to your requirements. Again printed in any colour on 80gsm or a selection of quality papers. DL (approx 210*99mm) or A6 (148*105mm). Paper to match. GO GREEN - All items above may also be printed on ECO friendly paper. Recycled. 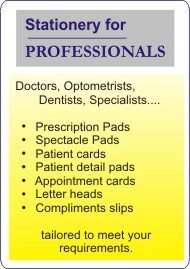 Letter heads, Prescription Pads etc.